Thanks for visiting my online shop! Dolphins, Manatees, Seals, and Dugongs Await, in playful and fun drawings to liven any day. Pink River Dolphins, Diverse groups of dolphins, Manatees from the Amazon and Oceans, and much more. Seals from the Arctic and Antarctic. Unique designs. Find what you're looking for yourself or great gifts for your friends. You'll find unique merchandise with my art on t-shirts, sweatshirts, mugs, stickers, pins, magnets, and more. Four species of Arctic seals including Harp seal, Hooded Seal, Ribbon Seal, and Walrus marine mammals. Grown and baby polar bears in various poses. Little Auks, or dovekies (Alle Alle) are small diving Arctic seabirds that and swim underwater, and nest in cliffs. Arctic Fox (Vulpes lagopus) are a carnivorous land mammal of the Arctic. Drawing. Polar Bear Mom and two Babies walking. Polar bears are top predators in the Arctic. Drawing. Polar bears are top Arctic predators, on ocean and land. Polar Bears are top Arctic predators on ice,ocean, and land, of seals and whales. Drawing. Walrus are Arctic, Atlantic, and Pacific ocean pinnipeds with long tusks. Drawing. 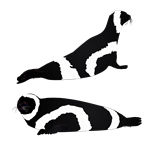 Hooded seals (Cystophora cristata) are Arctic and Atlantic Ocean Pinnipeds, the males inflate sacks to impress each other and females. Drawings. Beluga Whales (Delphinapterus leucas) are white toothed whales (related to Narwahls) of the Arctic ocean and around. Nature. Drawing. Puffins are arctic ocean birds. The Dall's Porpoise is a small Arctic toothed whale ocean mammal, with a unique body shape. Nature. Drawing. A pattern of Bowhead Whales, which are very long lived Arctic Ocean right baleen whale mammals. Drawing. Bowhead Whales are very long lived Arctic Ocean right baleen whale mammals. Drawing. 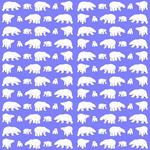 A cute pattern of baby harp seals, an arctic pinniped mammal. Nature. Drawing. A cute Harp Seal pup. Harp seals (saddleback seals) are an Arctic ocean and ice mammal. Nature. Drawing. Mother and baby harp seals (aka saddleback seal) Arctic ice and ocean mammals. Nature. Drawing. A pretty pattern of two kinds of playful pink Amazon river dolphins: Boto and Tucuxi. Nature. Drawing. A pattern of happy swimming manatees and dugongs. Nature. Drawing. Sea Otters are ocean mammals related to weasels and are nimble and flexible, feeding on clams, crabs, and fish in the kelp. Swim in Dolphins Pattern B has pilot whales, Orca,common dolphins, spotted dolphins, porpoises, narwhals, and Frasers dolphins in a mesmerizing pattern. Nature, art. 12 whales and dolphins decorate these: Blue, Orca Killer, Humpback, Minke, Pilot, and Gray whales, Pink Boto, Bottlenose, Fraser's,Spotted, dolphins, Narwhal, and Harbor Porpoise. Mom and Baby Manatee swim and play on shirts, hats, jewelry, etc. Four Dolphins Together: Spotted, Common/Bottlenosed,Frasers, Harbor Porpoise on shirts, hats, etc. Playful Dugongs, a sirenian mammal, animal of tropical seas, swim with Jacks on shirts, hats, pins, jewelry, etc. A pair of pink dolphins (Amazon River Boto and Tucxi dolphins) swim on everything shirts, hats, hoodies, stickers, jewelry, ornaments, wall art, etc. Sperm Whale, Moby, is a toothed whale mammal, deep diving eater of giant squid and fish. A Pilot Whale is a marine mammal toothed whale that lives globally and feeds deep on squid and fish. Drawing.